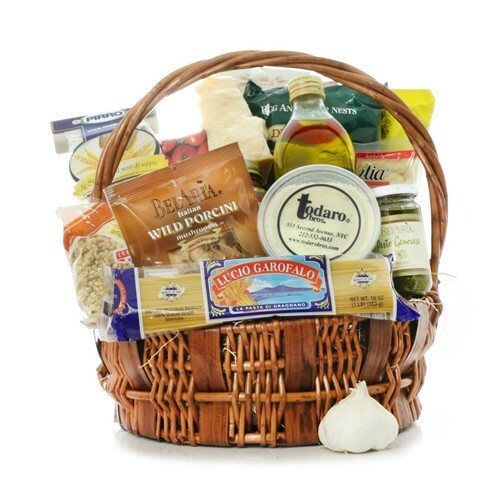 A basket that provides a bounty of ingredients for truly authentic pasta dinners! Just use your imagination and create! Starts out with a generous variety of pure durum wheat semolina pastas imported from Italy; potato gnocchi; a jar of marinara sauce; pesto alla Genovese; sugoloso sauce (sun-dried tomato & basil); puttanesca sauce; tomato paste in a tube; Todaro Bros. extra virgin olive oil; a chunk of Parmigiano Reggiano cheese with its own knife; dried porcini mushrooms; fresh garlic; and grissini breadsticks. Add wine and candlelight and ... Buon Appetito! Occasionally substitutions of equal value must be made but the theme of the basket is always consistent.